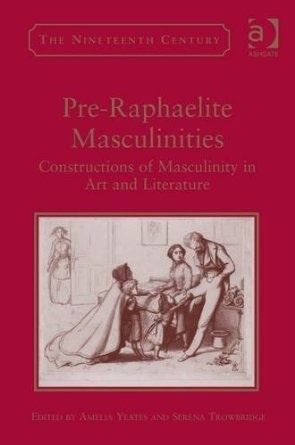 After several years of hard work, I’m delighted to say that Pre-Raphaelite Masculinities: Constructions of Masculinity in Art and Literature, edited by myself and Amelia Yeates, will be published by Ashgate very shortly. With excellent contributors and taking an innovative approach to Pre-Raphaelitism, we are really excited about this book! Drawing on recent theoretical developments in gender and men’s studies, Pre-Raphaelite Masculinities shows how the ideas and models of masculinity were constructed in the work of artists and writers associated with the Pre-Raphaelite movement. Paying particular attention to the representation of non-normative or alternative masculinities, the contributors take up the multiple versions of masculinity in Dante Gabriel Rossetti’s paintings and poetry, masculine violence in William Morris’s late romances, nineteenth-century masculinity and the medical narrative in Ford Madox Brown’s Cromwell on His Farm, accusations of ‘perversion’ directed at Edward Burne-Jones’s work, performative masculinity and William Bell Scott’s frescoes, the representations of masculinity in Pre-Raphaelite illustration, aspects of male chastity in poetry and art, Tannhäuser as a model for Victorian manhood, and masculinity and British imperialism in Holman Hunt’s The Light of the World. Taken together, these essays demonstrate the far-reaching effects of the plurality of masculinities that pervade the art and literature of the Pre-Raphaelite Brotherhood. Find out more or buy it here. Well done, both of you 🙂 I cannot wait to read the chapter on health, manliness and Edward Burne-Jones. Thank you! It’s been a long time coming. Hope you enjoy it!